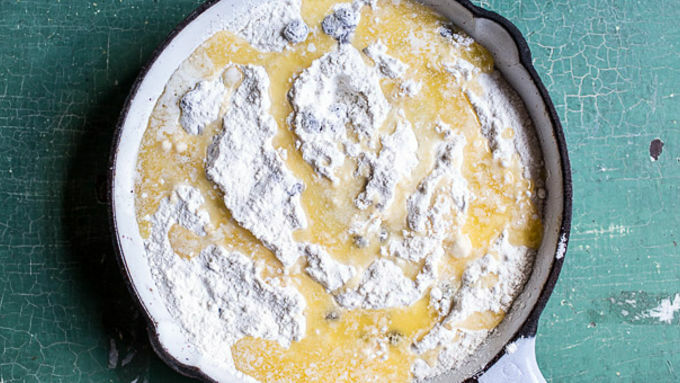 Preheat the oven to 350° F. Grease a large (12-inch) cast iron skillet or a 9x13-inch baking dish with softened butter. Add the blueberries to the prepared baking dish. Add the brown sugar, cinnamon and vanilla. Toss to combine. Then cover the blueberries with the cake mix. Pour the melted butter over the cake mix, but do not stir. Bake for 35-45 minutes, or until light brown. Meanwhile, whip the cream with an electric mixer. Fold in the blueberry yogurt. 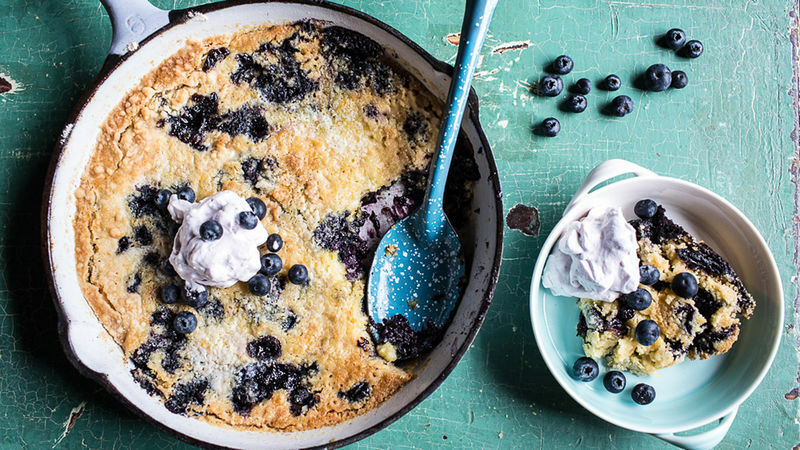 Serve the cake warm or cold, topped with a dollop of blueberry cream. 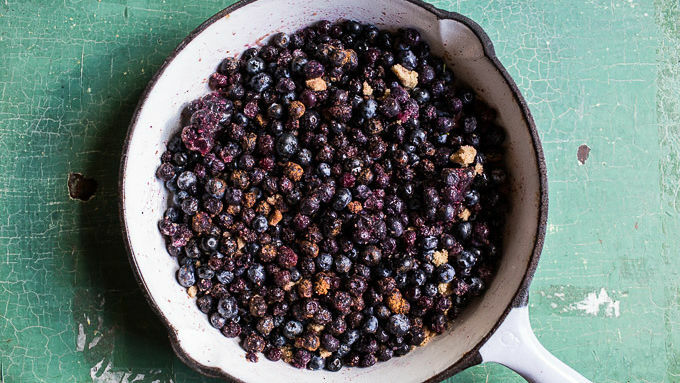 Substitute your favorite berries! Blackberries, raspberries, strawberries, cherries or even a combo will work well in this recipe. 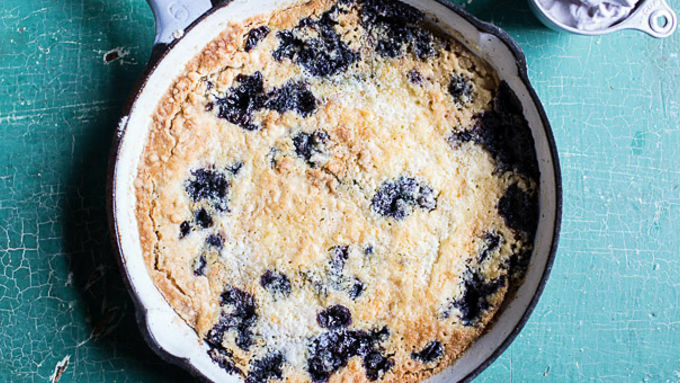 Can you believe that until this I’d never even made a blueberry cake, let alone a dump cake? And I call myself a baker! 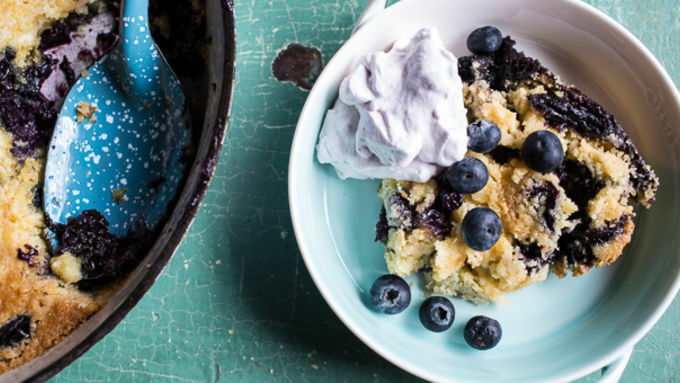 A blueberry dump cake seems like such a classic go-to recipe, so when I realized I had never made one (or even experienced one for that matter), I knew I needed to get after it ASAP. Also, dump cakes? They are amazing! You only dirty one dish, they take maybe 5 minutes to prep, and they taste amazing. No really, they’re kind of magical… with a weird name… but hey, it works! Okay, so for this dump cake I used blueberries, but honestly, any berry or even stone fruit would work. You can use whatever you love and/or have on hand. Blackberries, raspberries, strawberries, cherries or even a combo will work well in this recipe. Serve the cake warm or cold, topped with a dollop of the blueberry whipped cream. So good. So very, very good!